- Accelerate and brake slowly, those are the easiest times to lose control of your car. - Keep a winter weather survival kit with water, blankets, and other essentials in your car. Interstates in Omaha are back up to speed Sunday night after blizzard conditions forced drivers to put on the brakes. The storm is long gone from the area, but there are still some concerns as everyone heads to work Monday morning. 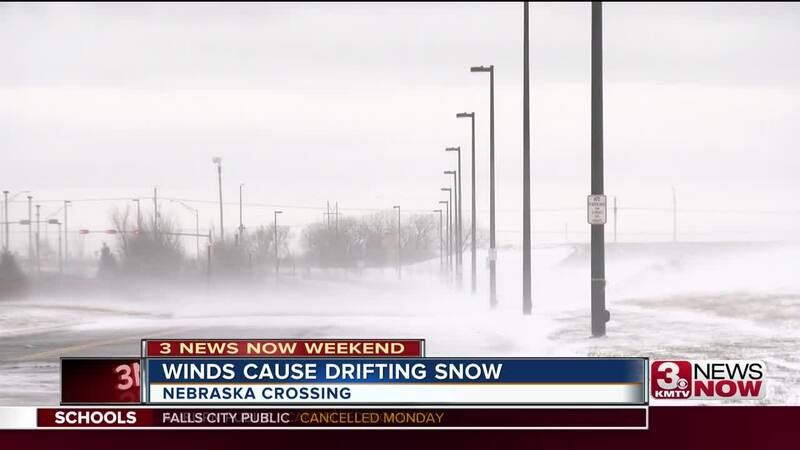 "The wind is not supposed to die down until early morning, so we'll be out," said Nebraska Department of Transportation's Jim Laughlin. Laughlin and dozens of his drivers will continue working Sunday night to prevent dangerous conditions from plaguing drivers during the Monday morning commute. "We're not as concerned about refreezing as we are about snow blowing on the highway," Laughlin said. "If you're coming down the highway and all of a sudden come over a hill and there's a drift of snow coming across the highway, it could cause somebody to lose control and spin out." Some southeast Nebraska drivers slid off the road due to drifting snow. State troopers shut off parts of I-80 for some time Sunday after cars and trucks spun off the highway. "This morning was pretty hectic," Laughlin said. "We had a lot of snow coming in really fast. Some highways are more prone to it than others." City trucks will continue to keep the snow out of the way during the Monday morning drive. "Don't use your cruise control as much," Laughlin said. "If you see a snowplow give it some room, they have a lot of blind spots and they need their room. They're big trucks."